From rocket scientist to creative artist, Jerry Rhodes has exploded onto the art scene. 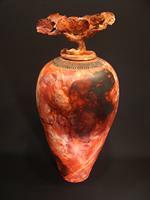 His work has appeared in numerous juried shows and competitions. Jerry currently exhibits in Charleston, South Carolina, Santa Fe, New Mexico, Valencia, California, and Bethlehem, Pennsylvania. He is fast developing an international reputation and is privately collected all over the world. He currently serves as the Joint Staff Air and Missile Defense Liaison to the North American Aerospace Defence Command (NORAD). 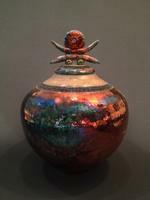 The firing process I use for my pottery is often described as Raku, but the motivation behind my use of this technique might be considered its philosophical opposite. Rather than seeking a harmonious balance or simplicity through my work, I try to achieve dynamic and imaginative results by challenging the boundaries of gravity, material science, chemistry, and sometimes, common sense. Having no formal training helps. I am not limited by what has gone before, nor do I feel obligated to follow any well established procedures. 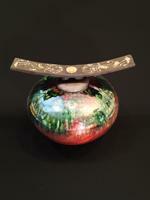 Often, though, I will use traditional style glazes and classic post firing reduction techniques. Other times, I will use plant food, steel wool, and horsehair during the firing, and add African porcupine quills to complete a composition. 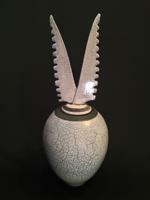 Sometimes, I will carve the words of a medieval chant or poems into the piece. The results are dramatic. Each piece is unique, each one represents a new and exciting learning experience, and every one is an adventure.